The market has been open for over a year and a half now. In that time we have been learning as we go. With conversations and over feedback from our guests we are always striving to improve ourselves& exceed expectations. When we have a guest looking for a specific item they enjoyed back home in Germany, the conversation is usually followed by a call or email to our distributors & their importers. One thing that many of our guests have asked for is something hot to add to our sandwich menu. We have finally figured out a way to make this request a reality. This week we introduced our new weekly hot special, and what a great week to start! Our usually hot & humid Florida day’s suddenly turned chilly. When everyone else was pulling out their coats & sweaters, Chef Josh wheeled out his smoker. Using our whole pork loins he set to work. Once the pork was perfectly smoked he made an Aventinus BBQ from one of our popular German beers. The pulled pork was so different in the most unique and wonderful way. Every bite was tender & juicy, falling apart with the unmistakable smoky flavor beneath the BBQ. The sauce picks up and carries the flavor profile of the Aventinus beer used in its creation. It shared the rich wheaty, taste of the dopple bock. I’m not a big fan of coleslaw’s. I usually end up with the kind that is drowned in mayo and sits in the pit of my stomach, or so soggy it should be described as a soup. However I’ve learned from experience that Chef Josh…knows what he’s doing. So while I was little apprehensive at first I figured as always I’d be pleasantly surprised by his recipe. It is almost sweet, not tangy at all. The shredded cabbage & carrots were all crisp & crunchy. It was covered with just enough sauce to flavor the bite. What I really liked was that it felt light & fresh, not heavy. On their own the BBQ Pulled Pork & coleslaw were the perfect way to sit back and re-live summer cookouts just one last time before the winter sets in. However when Chef Josh was planning this out in his head he had a totally different idea in mind. 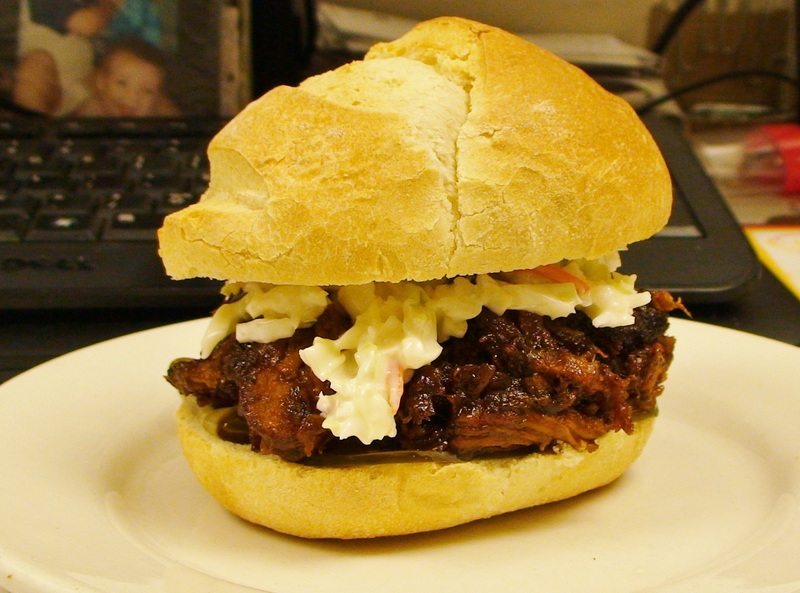 The pulled pork goes on the sandwich WITH the coleslaw & a few slices of dill pickle. I can only imagine the look of horror on my face, but after a little while I remembered that when it comes to all things culinary Josh won’t let me down. So I sat down at my desk with a Schweine-Q and dove in before I could psych myself out of it. As usually I was glad I tried something new. The heavier smoked taste of the hot pulled pork mixed very well with the cool light flavors of crisp coleslaw. Soft bread and small bite of the pickle rounded out the taste. If you don’t think you’re ready to be tough like me and mix BBQ & coleslaw you can always enjoying the other way with coleslaw as a side dish. While we are running this special both the Coleslaw & BBQ are available for purchase by the pound. Chef Reno has been creating German specials for the weekends over at Hollerbach’s Willow Tree Café. I have been spoiled because he has such great ideas for use of the items we have in the market. Now when I wander the aisles he usually walks with me offering suggestions on what could be made & combined. Today while wandering, I really wanted something sweet but decided that I would be better off with something a little more substantial. Halfway down the aisle I’m joined by the Chef and the conversation quickly picks up. After about 5 mins we agree that a soup would be perfect for today. When he brought the finished product to my desk I smelled it before he reached me. The warm scent of tomato and herbs caught my attention first. I did my best not to be distracted while I finished the paperwork before me so that I could focus and enjoy a special soup, which was also difficult because the presentation of the soup was just so fancy. Once the paper work was finished and moved a safe distance away from the bright red soup, I could really take in the smell. The scent of tomatoes and herbs was so wonderful and rich that I couldn’t discern anything else but the faintest smell of the cheese croutons. The texture was not watery which I loved, especially since I had been talking about wanting something that was a bit more substantial. What was a fantastic addition was the cheese croutons he made, lightly crunchy with the Gluten Free Panko Italian style breadcrumbs. Inside was the chewy, gooey goodness of melted provolone cheese. 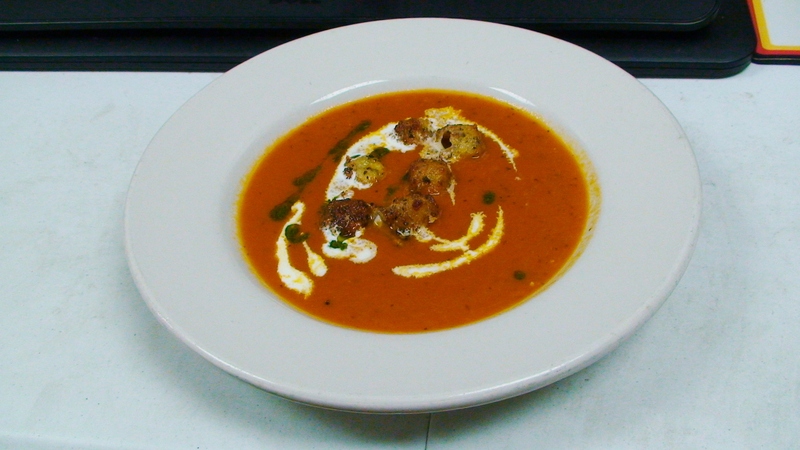 My mind was reeling with the combined flavors, such a decadent and delicious soup. After a few minutes the soup was gone and I was left sitting at my desk suffering the usual sadness that accompanies the end of a really good meal. What is wonderful is how Chef Reno wrote everything out so that again I can share the recipe with you. Cut onions in cubes and sauté in Olive oil. Then puree with Tomatoes and sugar, basil & garlic. Strain the seeds. Once cool enough to handle, add to soup. In case you would like to re-create the fantastic presentation Chef Reno used in the picture above he lightly drizzled Pesto, and heavy whipping cream to make the design. The above is exactly what Chef Reno used and it was enough to feed 4 of us with extra cheese croutons to go around! Now I LOVE fresh tomatoes, so I had to ask how many whole vine ripe tomatoes it would take to make this soup without having to use the canned kind. He said it depends on the size, but 6-8 should be about right to make the same amount.